Happy Labor Day everyone! 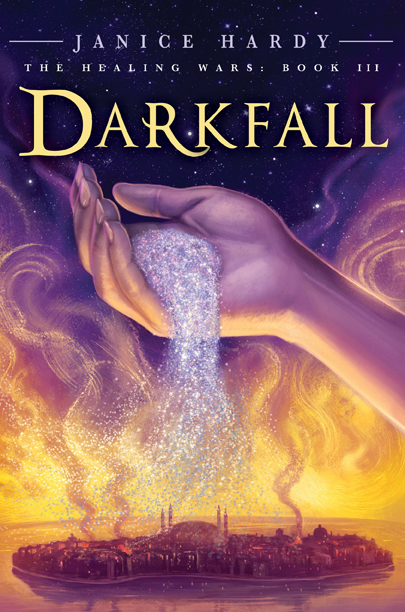 To celebrate the upcoming release of Darkfall, (October 4th) I'm giving away another ARC (advance reader copy) from my secret stash. You get a book, and all the typos that go with it, so you can see even the pros make mistakes. For this first contest, just leave a comment on this post and tell me what the hardest thing you've ever done is. The winner will be chosen by random next Monday, September 12th. What category that falls into is your call. The hardest thing in writing, editing, life, school, love, whatever works for you! Actually, it doesn't even have to be real. Make something up if you want. In PE class, holding plank position for five whole minutes in a contest. I think my arms ached for at least a day after that. hmm...the hardest thing I've done so far was moving to Germany and starting all over (job, friends, etc) in a foreign language. Took a break from the internet for 2 months? Actually, that was refreshing, although stopping was hard. Seriously, the hardest thing I've done involved standing up and talking to a certain bunch of people. I always have stage fright, but that particular time was the worst. My hand shook while holding my notes. Oh man, I would LOVE to win this ARC (hey random organizer~did I mention that September 12th is my birthday???)! I think the hardest thing I ever did was give birth to quadruplets on that cold day in February, high up on the mountaintop with only a very tiny piece of pynvium to push my pain into. Okay, that might have been made up. The hardest thing I had to do was break up with someone I loved in my younger years, because I knew he wasn't the right person for me. Yowch. Ask a hard question, why don't you. I'd say the hardest thing I ever did was to marry a man in the Navy, knowing he'd take me far away from my family and my hometown. It's been well worth it, even with the tears, deployments, and lonely pregnancy and child-rearing. I'm very glad my husband is a civilian now, though. The hardest (& stupidest) thing I've ever done? Climbing Half Dome when I had Mono. Hardest thing I've ever done? Tell the truth, knowing it will hurt another. The truth can cause pain, but sometimes it needs to be told. The hardest thing for me was when I moved from Germany to Sweden, didn't know the language well and was afraid of my first day at school. Actually no, that wasn't the hardest thing - it was when all my classmates except one bullied me. My only friend was bullied by the same people. Returning to university at age 27 to do a BA in a foreign country. OK, so it was England and I already knew the language, but being surrounded by 19-year olds when you're still just learning the lingo and differences of the country and culture, and didn't come from the same educational background (which makes itself apparent in tiny seminars) was intimidating. Especially thinking, "I'm nearly a decade older than these kids. I should feel confident!" The hardest bit was not feeling old and washed up. Saying no to a free book. The hardest thing I've ever done is having to put one of the Healing Wars books down! The hardest thing I have ever done? Watch my grandmother die of cancer, it was a slow and horrible death. However I die, I hope it isn’t that way. Hardest thing: 48 hours of back labor! Rebuilding myself after a betrayal by a man I trusted. Doesn't sound hard, does it? But it's ruins your self-esteem. Makes you believe you are ugly and unloveable and unworthy. The hardest thing I have done was living long distant with my husband for a year and a half. I can't imagine what Military families have to go through. My thoughts and love are with you all. I think going ahead to publish and promote my first book is the hardest thing I've done. This past year has been the hardest year ever. My husband was un/under-employed for nine months. I was the cheerful, hopeful one for that very long time. I remember counting cups of rice and how many days until some promised help would come. I remember the small miracles of someone dropping by with the leftover hamburgers and hotdogs after the church party, asking if we could use them. I remember working four 12hour shifts a week for the last three months until he got a job out of state and we had to pull up our roots and move halfway across the country. Through it all, my prayers, my boys and my writing kept me sane. It was hard. Things are (gratefully) better now. I think this will be a more gradual climb back to security than I had hoped. But, I thank the Lord for each day we are together, warm, safe and fed. That's a tough one. And a personal one. So I'll go for nearly-hardest, which was deciding to give up negativity and fear of failure. Well, it seemed hard, anyway. But in the end it's just a decision! The hardest thing I’ve done as a writer, I think, was to stop keeping it to myself and start talking about my work with other people. The hardest thing I've ever done to date... starting a completely new rewrite of my manuscript after I already sent a query out for it. And when I show him what I have of the rewrite? Oh, this is a hard one. Writing-wise, it was probably deciding to put my first novel 'in the drawer' when revising just wasn't working and I knew it would never be suitable for publication. But I don't regret it! Hardest thing I've ever done was sacraficing myself to my work in athletics and selflessly putting all I have into perfecting my skill and improving, even though at the time I didn't know if it would work out. I'd say its called love. The hardest thing has been abstaining from dancing while my back heals. I don't feel like myself when I don't dance. Thanks so much for the giveaway, Janice! Watching my grandmother go in and out of the hospital with cancer for over 5 years is by far the hardest thing I have ever done. Words cannot describe what it is like to see her in such a sick and helpless state. She never gave up and is still fighting, but it is so hard to see her healthy and happy one day and in a hospital bed unable to speak the next. Nobody should have to go through so much pain.